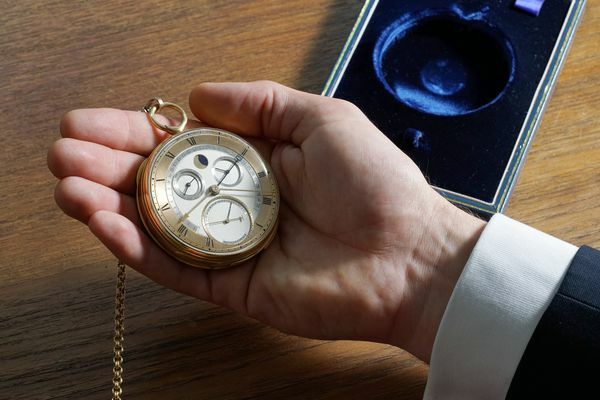 The very first pocket-watch that George designed and made in the late 1960s revealed the early signs of his singular genius with his creation of the self-starting detent escapement. This was the first vital step on the path that eventually led to the invention of his co-axial escapement which, today, is the most technically advanced escapement available, thanks to its superior efficiency over all others. It’s important to remember that George was, from the outset, finding his own way. The path laid out by the great makers had long since been obscured by the sands of time. 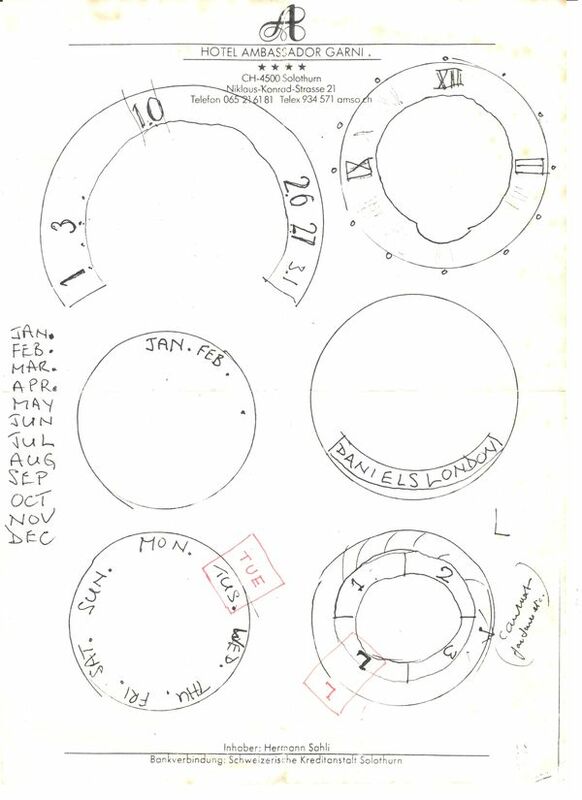 But once he mastered his technical art, I think it fair to say that each step forward taken by George Daniels was a step forward for all horology. Although he was not set against the vast industry of the Swiss, he was set apart from it. He was, and remained all through his life, a man apart. And his watches, as they always should, exemplified the man. George Daniels at the bench. The Grand Complication sits on a white tray in front of the master watchmaker. Throughout his career George made just 23 pocket watches. Each represented an improvement on its predecessor, with subtle improvements constantly being made to his stylistic and technical approach. 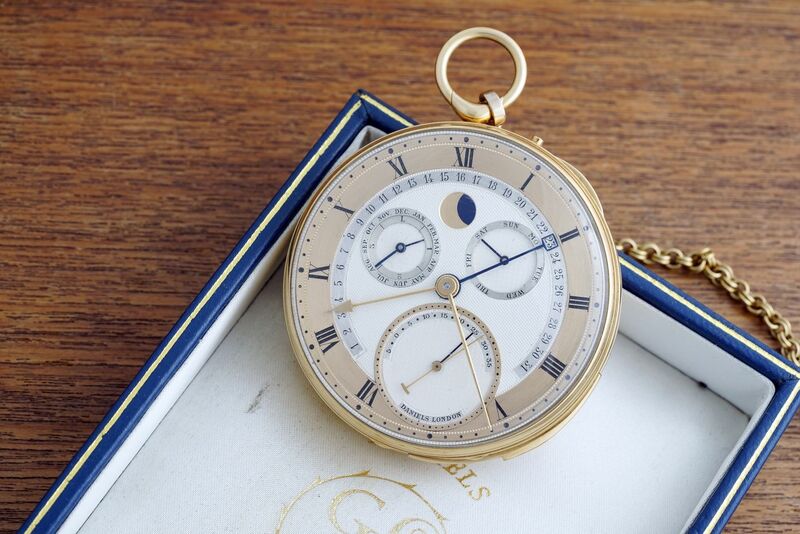 This magnificent Grand Complication is no exception and, for me, ranks as one of George Daniels’ seminal works. 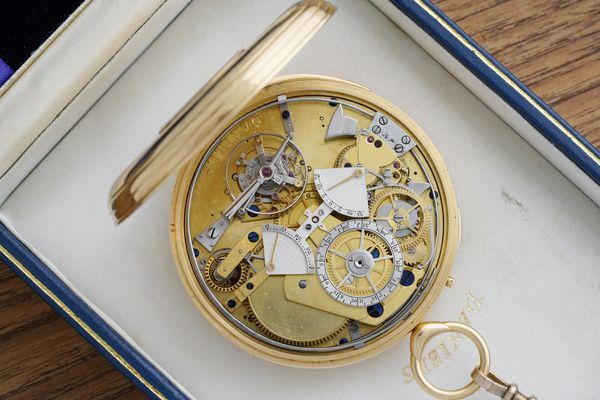 It is the second-to-last pocket-watch he completed and therefore has the additional renown of housing George’s greatest contribution to horology, the aforementioned coaxial escapement. Much has been written and said about the Daniels’ co-axial escapement. It famously achieved the true validation of the horological invention by being industrialised by Omega, who took the leap of faith. The co-axial escapement gave me the essential technical baton to run with and, today, my latest evolution of this singular design is helping to push the service intervals of mechanical wristwatches way beyond accepted industry standards. During our time together, George often shared the experiences and insights from his 4,500 hours of designing and hand-building the Grand Complication. Never leaving George’s ownership, it would accompany him whenever he wore his blue three-piece tailored pin stripe. Pepertual Calendar Mechanism. Credit: The George Daniels Educational Trust. George’s driving was erratic to say the least, but the howl of the super-charged engine more than made up for the terror of the drive (and drowned out my own expletives!). Upon arrival at any event George would immediately be surrounded by people wishing to view the watch he was wearing. This occasion was no exception and, when George pulled out the Grand Complication (to the usual gasps), he amused his audience with the chiming notes from its minute repeating mechanism and regaled them with tales of its technical superiority. False modesty was not in George’s nature! What George did so successfully was to learn from the best makers of history but crucially, to push their work forward. 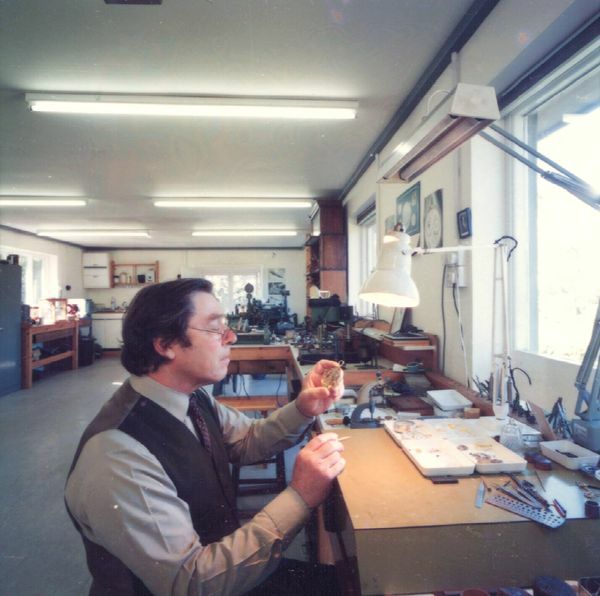 His watchmaking career was defined by a quest for improvement and George took many ideas from the past and either dismissed them out of hand or took their better qualities and improved on them. It was respect without the manacles of reverence. George was a stickler for aesthetics and he used to tell me that the most important feature of any watch is its dial. Why? Well, as George would point out in his ever pragmatic way, this is the feature which the eventual owner will look at day in, day out and so it has to be perfect without any compromise in its layout and aesthetics. This Grand Complication personifies George’s approach to dial design and is simple, balanced, elegant and, above all, readable at a glance with additional information revealed through the small display glass on the case back. The movement is simply breathtaking, completely original in its function and design, this is the culmination of a lifetime’s study and application. It showcases George’s immediately identifiable movement architecture, which I always describe as a very reductive aesthetic, with its beauty being derived from its simplicity and under embellishment. 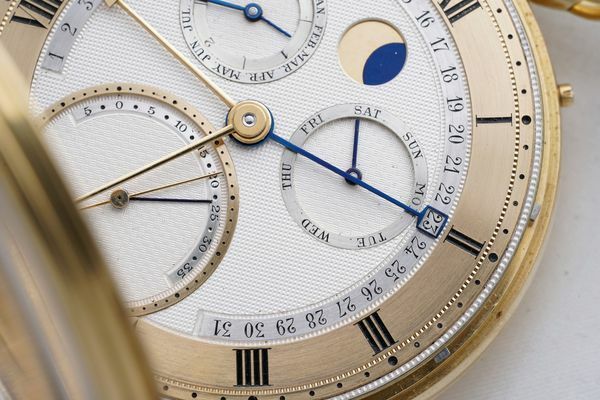 The perpetual calendar complication is a particular fascination for me and typifies George’s approach to watchmaking. There are accepted designs for complications which all follow the same pattern and layout, much as a 4 cylinder engine would have the same basic layout from different car manufacturers. 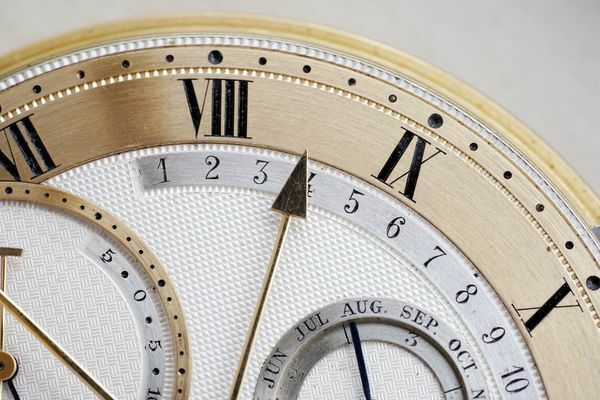 In designing this watch, George paid no attention to the standard perpetual calendar mechanism design. 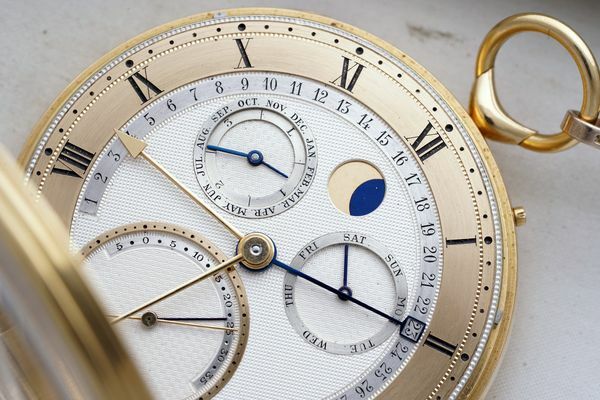 Instead, he adopted a new starting place based on his philosophy and his chosen dial design, which resulted in him having to create a completely original perpetual calendar mechanism. 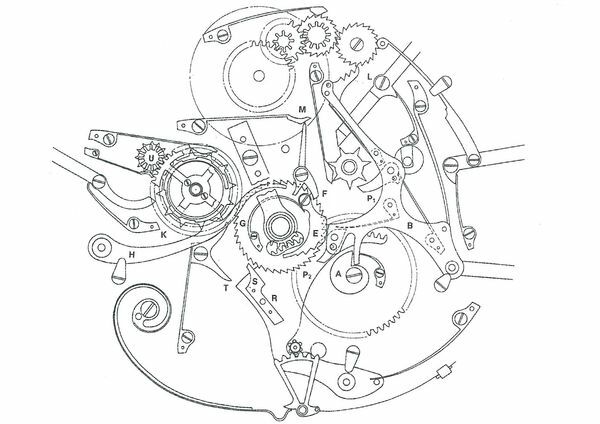 Interestingly there are no drawings for this complication, as George instinctively developed the mechanism as he progressed only recording his achievement with a pen and ink drawing upon completion. 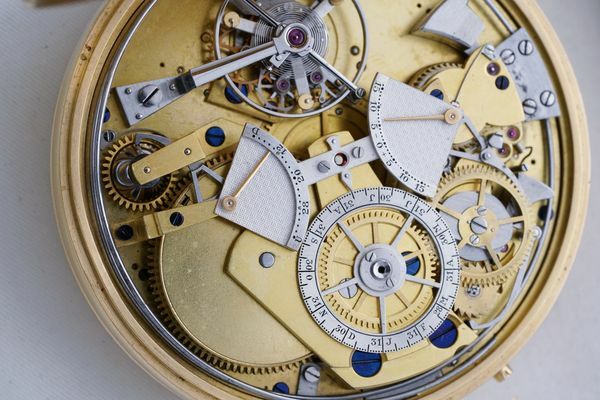 It is almost impossible to fully appreciate the significance of this Grand Complication. 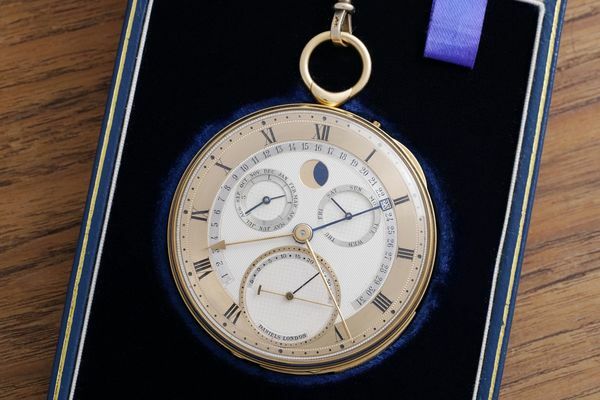 It is the work of a true genius’s lifetime and to acquire this pocket-watch is a once in a lifetime opportunity. 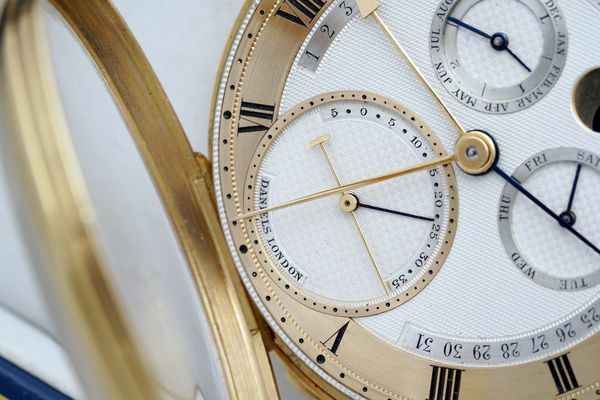 Phillips would like to sincerely thank Roger W. Smith for providing the text above, and for sharing images of George Daniels and sketches of his Grand Complication.